Tulsa, Okla.— January 15, 2019 — Hotel Internet Services (HIS), a full-service provider of internet services and solutions for the hospitality industry, has announced its implementation of advanced guestroom content streaming and voice control technology at the Ambassador Hotel Tulsa with the adoption of BeyondTV and HIS Wi-Fi. 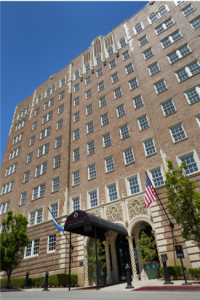 A luxury boutique property based in Tulsa, Oklahoma, Ambassador Hotel Tulsa is now able to ensure a fast and reliable guest internet connection, while also offering the latest conveniences in content casting and voice-activated guestroom amenity control. With hotel ownership recognizing growing guest demand for instant and more personalized service, Ambassador Hotel Tulsa selected BeyondTV due to its ability to serve as a comprehensive guestroom entertainment and convenience-enhancing solution. Guests using BeyondTV are able to instantly cast streamed content from personal devices onto the guestroom television, providing them with the advantage of a larger screen while avoiding the privacy concerns of having to input personal subscription login details. 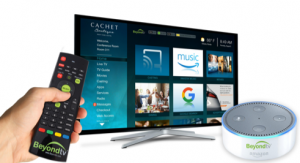 Through BeyondTV’s integration with Amazon’s Alexa, the property’s guests can now effortlessly control television functions with their voice alone, without having to locate or attempt to learn how to use the remote control. Through the integration with Volara, this voice-activated functionality can also extend to a hotel guestroom’s other amenities, including thermostats, lighting and drapes. Further enhancing guest convenience is the ability to use BeyondTV’s voice control feature to schedule wakeup calls and even communicate with a hotel’s various departments. BeyondTV also allows guests to order amenities such as room service from the comfort of their guestroom. As a leading provider of Wi-Fi services for the hospitality industry, HIS is also credited with providing Ambassador Hotel Tulsaguests with a seamless and reliable online experience when connecting their devices to the internet. Leveraging HIS’ expertise, Ambassador Hotel Tulsa can now ensure that guests are able to access a high speed and secure Wi-Fi connection, no matter where they are on the property.